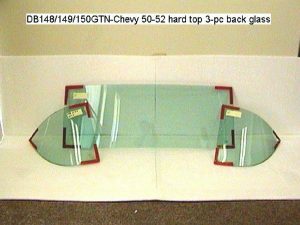 Listed here is the 3 piece rear windshield on the 1950-1952 Chevy Belair 2dr Hardtop clear no tint. Don’t be confused by the picture in which the glass is tinted. The glass you are buying here is clear glass.